Although there were a few hiccups along the way, the bullpen was an overwhelming strength for the Yankees in 2018. Dellin Betances was dominant in the eighth inning and David Robertson, Chad Green, and Jonathan Holder were very effective in the sixth and seventh innings. 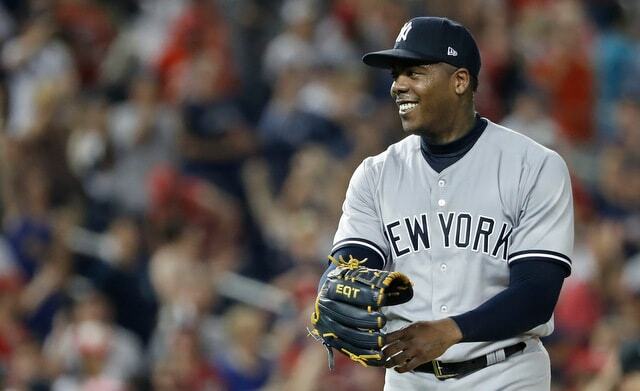 Aroldis Chapman was as good as he’s ever been, at least when his knee wasn’t acting up. The high-leverage relievers get all the glory. Many games are won and lost in the middle innings though, especially nowadays with starters throwing fewer innings than ever. Those fifth and sixth inning situations are every bit as important as the eighth and ninth innings. And, for much of this year, lefty Chasen Shreve and righty Adam Warren handled those middle innings for the Yankees. Warren and Shreve started the 2018 season as, at best, the fifth and sixth best relievers in the bullpen. They finished the 2018 season in other uniforms. Warren and Shreve were traded roughly 43 hours apart in the days leading up to the July 31st non-waiver trade deadline and they were traded for very different reasons. Let’s review their half-seasons in pinstripes. Shreve joined the Yankees almost four years ago in a January 2015 trade with the Braves. Former top prospect Manny Banuelos went to Atlanta for Shreve and David Carpenter. Feels like a lifetime ago, doesn’t it? Shreve went up-and-down (mostly up) from 2015-17 before running out of minor league options and having to stick for good in 2018. 2018 Performance: Much like 2015-17, the 2018 season featured stretches of dominance and stretches where Shreve was simply unplayable. He carried a 0.00 ERA into early May and held opponents to a .156/.240/.289 batting line with 16 strikeouts in his first 12 innings. That was one of those “hey maybe he’s back to where he was in the first half of 2015” stretches. It didn’t last. It never did with Shreve. On May 4th, Shreve faced four Indians batters, allowed all four to reach base, and was charged with four earned runs. That 0.00 ERA became a 3.75 ERA in the span of 16 pitches. Shreve was okay for a few weeks after that before the wheels came off in late May. Two runs on May 23rd. Two more runs on May 26th. Six runs in 7.1 innings spanning eight appearances from June 13th to June 30th. Shreve took a 4.97 ERA (5.51 FIP) into July. He’d thrown 29 innings. Aaron Boone limited to Shreve to low leverage work in July — only twice in nine July outings did Shreve enter with the score separated by fewer than three runs — and he finished the Yankees portion of his season with a 4.26 ERA (4.98 FIP) with 27.1% strikeouts and 10.6% walks in 38 innings. The strikeouts were nice. The overall body of work was as close to replacement level as it gets. Signature Moment™: This is easy. It was July 21st against the Mets. Chapman needed work after a long layoff during the All-Star break, so he entered the ninth inning with a four-run lead. His inning went walk, single, walk, walk, hit-by-pitch. Five batters, 19 pitches, three strikes. Two runs were in and the Mets had the bases loaded with no outs. Betances, Robertson, and Holder all pitched earlier in the game and Green had a long outing the previous day, so he was unavailable. Boone had two options. He could stick with Chapman or go to Shreve. Sticking with Chapman did not seem wise given the way he was throwing. Shreve it was. Chasen inherited the bases loaded with no outs situation, and nailed down the save with a 4-3 double play and a tapper back in front of the plate. Ex-frickin-hale.
? That was career save No. 2 for Shreve. (He saved an extra innings game in Kansas City in 2016.) It was also his third-to-last appearance as a Yankee. He faced five batters and allowed three hits on July 26th and faced five batters and allowed one run on July 28th. That July 28th appearance came in the first game of a doubleheader. Shreve was traded after the second game of the day. Why Was He Traded? The Yankees acquired J.A. Happ from the Blue Jays on July 26th and, at the time, they Yankees were carrying four starters and nine relievers. A reliever had to go to make room for Happ and it was either Shreve or A.J. Cole. Cole was pitching pretty well at the time, remember. The writing had been on the wall for weeks. The only question was either Shreve would be traded or designated for assignment. 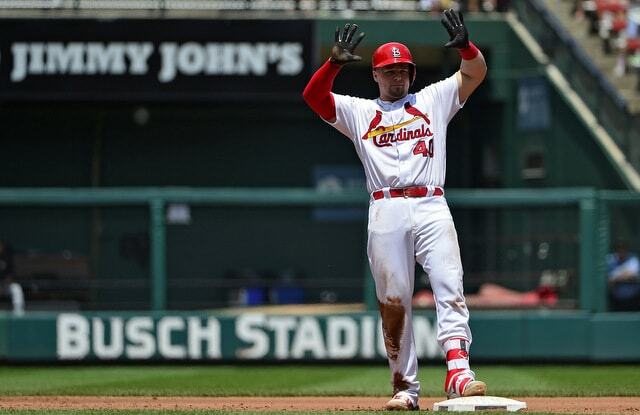 Following that July 28th doubleheader the Yankees traded Shreve (and Gio Gallegos) to the Cardinals for Luke Voit (and international bonus money). Happ had his roster spot and the Yankees had a right-handed hitting first baseman to replace Tyler Austin, who would soon to be traded to the Twins. Shreve was very emotional after the deal was announced.
? Rough. Players love being Yankees. They rarely want to leave. Shreve had been with the team for three and a half years and had grown close with many teammates. It’s a business though, and if you don’t perform, teams will find guys who do. The fact Shreve’s a lefty who can miss bats meant he had some trade value and wasn’t simply cast aside on waivers. What’d He Do After The Trade? 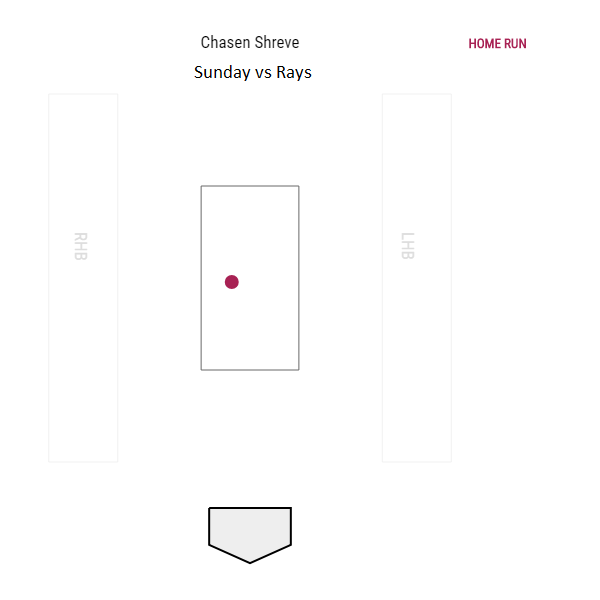 Typical Chasen Shreve stuff. He threw 14.2 innings with a 3.07 ERA for St. Louis but man, the peripherals were ugly: 24.6% strikeouts, 13.9% walks, 20.5% ground balls, and a 1.84 HR/9 for a 5.48 FIP. Shreve finished the 2018 season with a 3.93 ERA (5.12 FIP) in 52.2 innings total. He is arbitration-eligible for the second time as a Super Two this offseason and MLBTR projects a $1.2M salary in 2019. I could see him being non-tendered at that salary. Yankee Legacy: Shreve was legitimately excellent for the first four months of 2015. Remember that? He had a 1.89 ERA (3.86 FIP) in 52.1 innings before things fell apart in September. Shreve and the Yankees then spent 2016-18 chasing that 2015 success. He finished his Yankees career with a 3.92 ERA (4.99 FIP) in 174.2 innings. That’s good for +1.8 WAR. There were some moments of greatness, but, by and large, we spent the last few years wondering how many more chances Shreve would get. Unlike Shreve, Warren was an original Yankees draft pick. They took him in the fourth round in the 2009 draft. He’d been teammates with future big leaguers Matt Harvey, Dustin Ackley, and Kyle Seager at UNC. The Yankees traded Warren to the Cubs for Starlin Castro in December 2015, realized they couldn’t live without him, then reacquired him in the Chapman trade at the 2016 deadline. 2018 Performance: In his very first appearance of the 2018 season, Warren took a comebacker to the right ankle and was put on the shelf for a few days. Then, in late April, he went down with a back problem that sidelined him a little more than six weeks. It was during that six-week absence that Cole seemingly emerged as a reliable multi-inning middle reliever. That jack of all trades reliever. Around the ankle and back injuries Warren had a typical Adam Warren season. 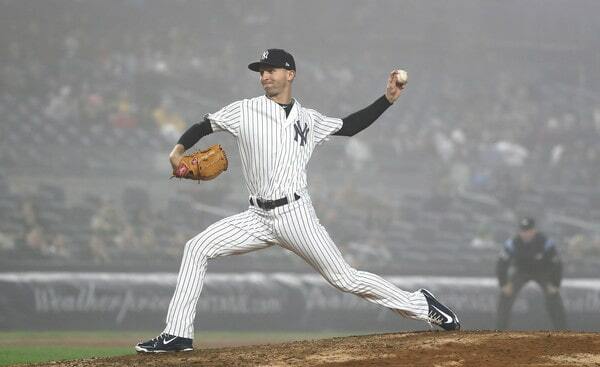 He threw 30 innings with the Yankees and posted a 2.70 ERA (3.29 FIP) with strikeout (28.9%) and walk (9.4%) rates that ranked among the highest of his career. The Yankees got Warren to buy into the anti-fastball philosophy — he threw more sliders (45.4%) than fastballs (38.9%) before the trade — and the strikeouts ticked up. Warren was the Swiss Army Knife reliever under Boone the same way he was under Joe Girardi. He entered games in the third, fourth, fifth, sixth, seventh, eighth, and ninth (and 12th) innings and in just about every situation. High leverage, low leverage, you name it. The back injury cost him six weeks. Otherwise Warren was very effective and used pretty much whenever needed. Can’t beat that kind of versatility. Signature Moment™: Eh, Warren didn’t really have a signature moment this season. Certainly nothing like Shreve bailing out Chapman. How often do middle relievers have signature moments anyway? I guess Warren’s signature moment came on July 8th. 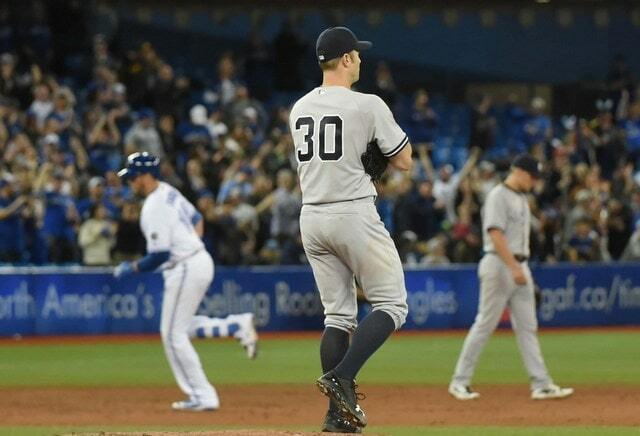 With the score tied 1-1 and the bullpen a little short due to recent workloads, Warren threw scoreless seventh and eighth innings in Toronto to set the Yankees up for a tenth inning win.
? At +0.193 WPA, it was Warren’s most impactful game of the season. Not the greatest highlight, I know, but two scoreless and thankless innings in a win is about as Adam Warren as it gets. Why Was He Traded? We all knew Shreve was a goner. The Warren trade was a surprise and it was part of a series of moves. First, the Yankees traded Shreve for Voit, which gave them right-handed hitting first base depth. That allowed them to trade Austin for Lance Lynn. And, with Lynn on-board as a multi-inning relief option, the Yankees traded Warren straight up for international bonus money. Specifically $1.25M from the Mariners. There were a few layers to this. For starters, it was a salary offset. The Twins paid half Lynn’s remaining salary and dumping Warren made the Lynn pickup salary neutral. That was not a small thing given the luxury tax plan. And two, the Yankees wanted someone better able to move into the rotation, if necessary, and it turned out to be necessary thanks to Sonny Gray. Lynn was stretched out to 100 pitches. Warren was not. So, to wrap that all up, the Yankees traded Warren for three reasons. One, they wanted a pitcher better able to step into the rotation in Lynn. Two, they wanted to offset Lynn’s salary. And three, they wanted the international bonus money to sign Vargas. Trading a quality multi-inning reliever to a fellow AL contender (the Mariners were in wildcard position the day of the Warren trade) seemed awfully weird, especially since the Yankees had a more disposable reliever in Cole and appeared to have the payroll room to keep Warren and add Lynn, but whatever. What’d He Do After The Trade? Meh. Warren threw 21.2 innings with a 3.74 ERA (4.82 FIP) with the Mariners as they crashed out of the postseason race. He was fine. Not great, not terrible. He was fine. Warren with the Yankees: 3.18 ERA (3.61 FIP) and +7.6 WAR in 407 innings. Warren with the Cubs and Mariners: 5.08 ERA (5.42 FIP) and -0.4 WAR in 56.2 innings. He can’t can only handle New York! Yankee Legacy: Warren is the closest thing the Yankees have had to Ramiro Mendoza since Ramiro Mendoza. He was the rubber-armed do-it-all reliever. Warren was never the team’s best reliever. Heck, he never their second or third best reliever, but he was as steady and reliable as middle relievers come. I’ll always remember Warren’s three-inning appearance the night the Yankees clinched a postseason spot in 2015. The bullpen had been worked hard in previous days and Warren stepped in to throw scoreless sixth, seventh, and eighth innings with a small lead.
? That was Adam Warren the last few years. He did whatever the Yankees needed for however many innings the Yankees needed. From 2013-18, his +7.2 WAR made him a top 25 reliever in baseball, and remember, he was at +7.6 WAR with the Yankees. Warren was rock solid and seemingly perpetually underappreciated. He’s a free agent this winter and I guess a reunion is possible, but it seems unlikely. The Yankees got the best years of his career and they’ll likely let someone else pay for his decline. Following tonight’s win the Yankees announced they have traded lefty Chasen Shreve and righty Gio Gallegos to the Cardinals for first baseman Luke Voit and an undisclosed sum of international bonus money. The move clears a 25-man roster spot for J.A. Happ, who was acquired Thursday. The Yankees had been carrying four starters and a nine-man bullpen these last few days and they had to unload someone to make room on the roster for Happ, and Shreve is the odd man out. Realistically, it was either Shreve or A.J. Cole, and Cole’s pitched quite well with the Yankees, so he stays. ?Your browser does not support iframes. The 26-year-old Gallegos has been the quintessential up-and-down reliever the last two years, throwing 30.1 innings with 32 strikeouts and a 4.79 ERA (3.98 FIP) for the Yankees. Over the last two seasons he has a 2.79 ERA (1.99 FIP) with a 38.7% strikeout rate in 71 Triple-A innings. With Gallegos traded, I imagine Tommy Kahnle will take over as the primary up-and-down reliever. Voit, 27, is essentially Garrett Cooper with more power. He’s a career .240/.307/.432 (95 wRC+) hitter with five home runs in 137 big league plate appearances scattered across the last two seasons. Down in Triple-A, Voit is hitting .299/.391/.500 (133 wRC+) with nine homers in 271 plate appearances this year. He’s a right-handed hitting first base only guy. The Yankees already have Tyler Austin and Ryan McBroom, two other right-handed hitting first basemen, down in the minors. Voit is a better hitter than McBroom — he has more power, if nothing else — and, unlike Austin, he has minor league options remaining for 2019 and 2020. This is Austin’s final option year. For all intents and purposes, Voit is the new up-and-down first baseman. To me, the trade was more about the international bonus money and getting something for Shreve rather than nothing. Had the Yankees designated him for assignment to clear a spot for Happ, he’d be lost on waivers. No doubt. Trading Gallegos clears a 40-man roster spot for … whoever needs one next. The Yankees have really cleaned up the fringes of the 40-man roster with their recent deals. Update: Jesse Sanchez says the Yankees received $1M in international bonus money in the trade. As expected, the bullpen has been a strength for the Yankees so far this season. The relief crew actually got off to a bit of a rocky start the first week or two, though things have settled down nicely since, and Aaron Boone now has arguably the best and deepest bullpen in the game at his disposal. Shutdowns and meltdowns are a neat win probability stat. Shutdowns are relief appearances that increase the team’s win probability least 6%. Meltdowns are relief appearances that decrease the team’s win probability at least 6%. Long story short, the Yankees have had an excellent bullpen this year, and that was the expectation coming into the season. Time to grade the relievers. Expectations for Betances were pretty low coming into the season. He collapsed down the stretch last year and his control disappeared — Dellin walked eleven batters in his final 12.2 regular season innings — so much so that he was basically persona non grata in the postseason. Use only in an emergency. The Yankees stuck with Betances over the winter when much of the fan base was ready to dump him. And, coming out of the gate this year, it seemed Betances was still broken. He allowed a homer in his first appearance of the season and Kevin Pillar embarrassed him by stealing his way around the bases in his second appearance. 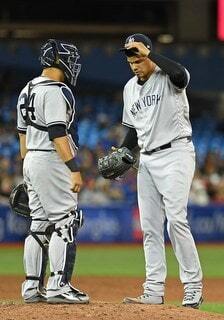 Six appearances into the season, Betances had allowed six runs on ten hits and three walks in 6.2 innings. He allowed three homers in his first 6.2 innings this year after allowing three homers in 59.2 innings last year. Something funny happened after that: All-Star Dellin Betances returned. The Yankees and Boone said they were going to stick with Betances and get him right, and they did. Since April 14th, Betances has pitched to a 1.56 ERA (1.70 FIP) with lots of strikeouts (44.1%), lots of grounders (48.2%), and a tolerable amount of walks (11.8%) in 34.2 innings. Opponents are hitting .121/.244/.164 against him in those 34.2 innings. The knee-bucklers are back. The swag is back.
? With Betances, given his history, it always feels like we’re waiting for the other shoe to drop. Will this be the outing when he hits a batter and walks three? I get it, and it’s not an unreasonable feeling after last season. For now though, Betances has reclaimed the eighth inning setup role and gone back to being a monster strikeout machine. He could’ve gone to his fifth straight All-Star Game this year but did not. That doesn’t diminish his season performance at all. The first year of Chapman’s reliever record five-year, $86M contract did not go according to plan. He got hurt early in the season and lost his closer’s job at midseason before finding it late and dominating in the postseason. This year, Chapman has come right out of the gate looking like the historically great late-inning reliever he’s been basically his entire career. Through 95 team games Chapman has a 1.35 ERA (1.49 FIP) with his typically excellent strikeout rate (44.2%) and a strong ground ball rate (46.3%). His 10.4% walk rate is a tick below his 11.3% career average. Chapman is 26-for-27 in save chances and, in the one blown save, he didn’t even get hit around. A single, a hit-by-pitch, and two wild pitches pushed a run across. And the Yankees won that game anyway, so who cares? 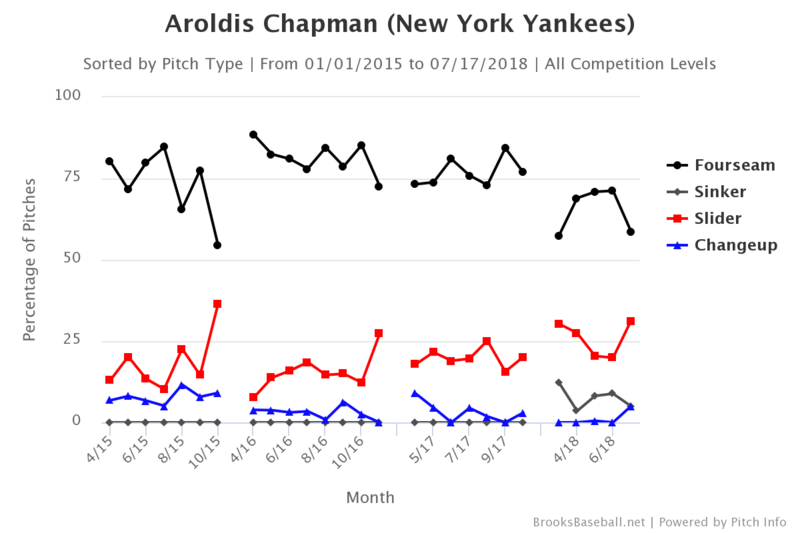 We are more than halfway through the season now, so we can say for sure Chapman’s trademark velocity is down a tick. He’s averaging a still otherworldly 99.7 mph with his fastball. That’s down from 100.2 mph last year and 101.1 mph the year before. You have to go back to 2013 for the last time Chapman’s average fastball velocity was this low. We still see a few 103s and 104s, though not nearly as frequently as in the past. Chapman is 30 years old now and he has been pitching basically his entire life, so a little velocity loss is no surprise. It is completely natural. He’s compensated for that velocity loss — again, the dude is still averaging 99.7 mph with his heater, so it’s not like he’s out there slinging mid-80s gas — with more sinkers and more sliders, especially with two strikes. It has worked wonderfully too. Amazingly, Chapman has pitched this well despite ongoing tendinitis in his left (push-off) knee. He’s been dealing with it for weeks and he’s admitted he’ll probably have to deal with it all season. Chapman is getting regular treatment and it hasn’t stopped him from taking the mound — the knee did force him to leave a game earlier this month, though that had more to do with not wanting to push it with a four-run lead than “I can’t pitch it hurts too much” — so that’s good. I’m not a big fan of players — especially very important players — playing through an injury, but what I think doesn’t matter, so Chapman will continue to pitch through the knee trouble. The doctors know better than me anyway. Even with the knee trouble, Chapman is having a truly outstanding season, a season that deservedly sent him to the All-Star Game. He’s been a rock in the ninth inning. Hand him a lead and the game is over. Cole is that kid whose family moved in the middle of the school year and the teachers at his new school grade him on a curve. The Yankees acquired Cole from the Nationals in a cash trade on April 24th because they needed a long man, and, as a 26-year-old former top 100 prospect, he offered some upside. Cole was terrible with Washington — he allowed 15 runs and 22 baserunners in 10.1 innings before the trade — but he was a low risk pickup. At worst, he’d soak up some innings in a blowout, then be cast aside for the next guy. 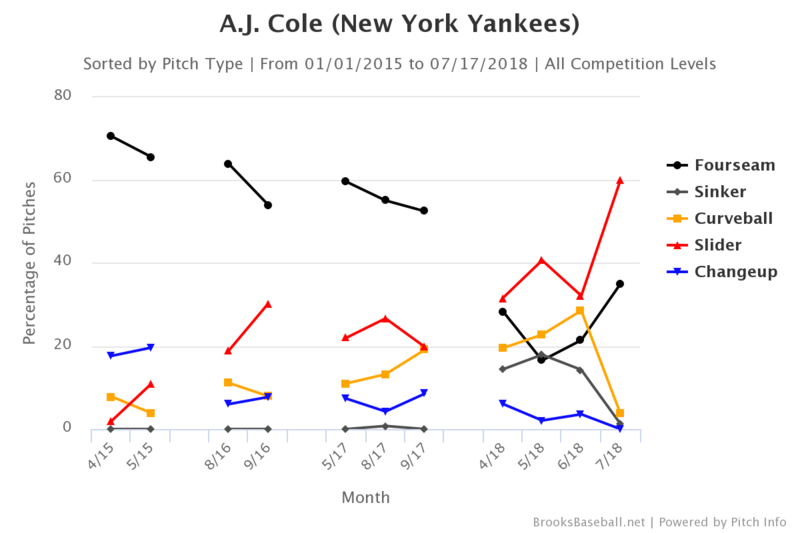 Instead, Cole has become the best long man the Yankees have had in quite some time. Probably since 2013 Adam Warren. He’s allowed one run in 18.2 innings around a minor neck injury, striking out 24 and holding opponents to a .172/.243/.234 batting line against. The Yankees, as they are wont to do, have Cole throwing far more sliders than ever before. The Yankees have such a good bullpen that they haven’t needed Cole to pitch in high (or even medium) leverage situations. His average leverage index when entering the game is 0.53. That’s nothing. That is 33rd lowest among the 324 relievers with at least ten innings pitched this season. Perhaps there will come a time when Cole can audition for high leverage work. Right now, the Yankees don’t need him in that role. He can be a highly effective long man and there’s nothing wrong with that at all. Two things are true this season. One, Green has been very good overall. Two, Green has not been as good as last season. Two blowups in two appearances prior to the All-Star break left a sour taste in everyone’s mouth, though, prior to those last two appearances, Green had a 1.91 ERA (2.39 FIP) in 42.1 innings. He was fantastic and he probably deserved to go to the All-Star Game. Good numbers overall but also some discouraging trends. Green’s strikeouts are down, he’s not getting as many swings and misses with his trademark fastball, and his home run rate is up. He’s allowed six homers in 46 innings this season after allowing four homers in 69 innings last year, so yeah. That includes two back-breaking homers in his last two appearances of the first half. I think Green’s step back this season — and by step back, I mean going from elite to merely above-average — has more to do with it being incredibly hard to succeed as a fastball only guy. Green’s slider kinda stinks but his fastball is great in terms of velocity and spin rate. But unless you have Chapman’s velocity, it’s hard to throw fastballs by hitters long-term. Green did it most of the season. Things kinda got away from him those last two outings. Aside from Chapman, pretty much every reliever in the bullpen has been written off at some point this season. People were ready to move on from Betances, from David Robertson, from Jonathan Holder, so on and so forth. It seems it is now Green’s turn. Fortunately, the Yankees call the shots, not fans, and they’ll stick with Green and work to get him right. And, chances are, he’ll get right soon enough. No, Green has not been as good as last year. But he’s still been very good overall, and I see those last two outings as more of a bump in the road than anything. Another reliever who gets an A. Fourth in five reviews so far. Holder was in the Opening Day bullpen as basically the last guy on the roster, though he quickly earned a demotion to Triple-A after allowing seven runs and eight baserunners in his first 2.2 innings of the season. That includes taking the loss in a frustrating 14-inning game against the Orioles on April 6th. Holder went to Triple-A, resurfaced in late April after Adam Warren went down with a lat issue, and since then he’s been out of this world good. He’s thrown 36.1 innings with a 0.50 ERA (1.99 FIP) since returning, with a good strikeout rate (22.4%) and an excellent walk rate (3.7%). It felt like he “arrived” on June 18th, when he inherited runners on the corners with no outs and a one-run lead against the Nationals, and didn’t allow a run to score. ?? Holder’s newfound success comes after a change in his pitch mix. He went to Triple-A, scrapped his high-spin curveball, and came back as a fastball/slider/changeup pitcher. He’s always had the slider and changeup, but they took a backseat to the curveball. Now the curveball is taking a backseat to the slider, which he uses against righties, and the changeup, which he uses against lefties. Goodbye curveball (and cutter), hello slider and changeup. That adjustment has helped Holder make the jump from up-and-down depth arm to reliable middle reliever. In fact, on most other teams, I reckon Holder would be pitching in a traditional setup role by now. But because the Yankees are so deep in quality relievers, Boone is able to use Holder in the middle innings, when the starter bows out early and it’s a little too early to go to Betances and Green. Holder has been invaluable in that role. Tough, but fair. Expectations were high for Kahnle coming into the season because he was so good last year and so effective in the postseason. Instead, Kahnle has been injured and ineffective this year. He’s allowed eleven runs and 16 baserunners in nine big league innings around a biceps/shoulder injury, and, worst of all, he’s walked as many batters as he’s struck out. Ten apiece. Ouch. The Yankees sent Kahnle to Triple-A in early June — he essentially lost his middle innings job to Holder — and, with Triple-A Scranton, he owns a 2.81 ERA (2.32 FIP) with 37.6% strikeouts and 10.6% walks in 16 innings. That’s good. Certainly better than what he did in his limited big league time this year. So it’s not like Kahnle has suddenly forgotten how to pitch, you know? The big issue this year is fastball velocity. Kahnle’s heater averaged 98.1 mph last year and 97.0 mph the year before. This season it was down to 95.6 mph. The fastest pitch he threw with the Yankees this year checked in at 97.6 mph. That’s still below last year’s average fastball velocity. Minor league velocity reports can be unreliable, though they have Kahnle sitting 95-96 mph with the RailRiders. On one hand, 95-96 mph is plenty good enough to get outs at the big league level. Holder’s fastball is averaging only 93.2 mph this season, for example. On the other hand, Kahnle is not exactly blessed with great command. He’s a pure grip it and rip it pitcher, and hey, that works too. Worked great for him last year. But Kahnle at 95-96 mph is a different animal than Kahnle at 98-99 mph. Especially since the velocity on his changeup is unchanged. The velocity gap between the two pitches is smaller and that makes both of them less effective. Kahnle has been down in the minors long enough to delay his free agency, which I guess is good for the Yankees. I suspect they’d happily trade that extra year of control for a healthy and effective Kahnle at the big league level though. He was part of that big trade last season with the idea that he’d be a long-term bullpen piece. Instead, Kahnle has been a non-factor this season, and it’s unclear whether he’ll regain last year’s effectiveness at some point. 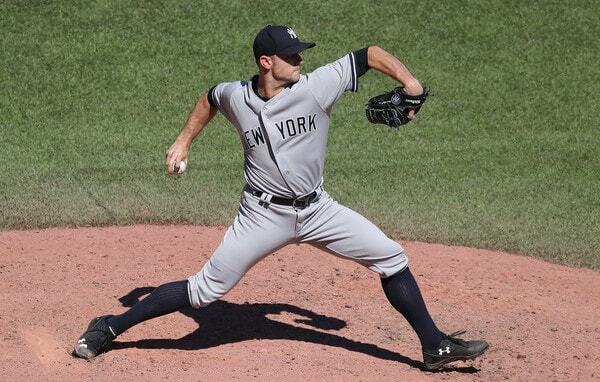 Ho hum, another typically strong David Robertson season. He’s basically the CC Sabathia of the bullpen at this point. Still very effective, still lots of folks seemingly ready to call him done any time he stumbles. Robertson had a rough patch in May but has otherwise been very good this season, pitching to a 3.09 ERA (2.47 FIP) with strikeout (30.5%) and walk (8.1%) rates right in line with his career norms. He is the same guy he’s always been. That is a man who is not married to a specific inning. Robertson was out of this world good after rejoining the Yankees last season — he allowed four runs in 35 innings after the trade — and he was great in the postseason. He hasn’t been quite that good this year, but he’s been very good overall. As good as he is, I still get the feeling Robertson is underappreciated. He’s a hell of a reliever. I suppose you could argue Shreve is meeting expectations. He owns a 4.54 ERA (5.22 FIP) with 28.8% strikeouts and 11.1% walks in 33.2 innings this season. From 2016-17, he pitched to a 4.37 ERA (5.06 FIP) with 26.8% strikeouts and 11.2% walks in 78.1 innings. Shreve is the same guy right now that he’s been the last two years. Unfortunately, that makes him a replacement level reliever. As the very last guy in the bullpen — and that’s what I think he is at this point, I think Cole has jumped him in the pecking order — Shreve is okay. He’s someone who takes a beating in blowout games, basically. The problem isn’t Shreve, really. It’s that Boone keeps using him in somewhat leveraged left-on-left matchup situations even though Shreve isn’t good against lefties. They’re hitting .239/.364/.556 (.386 wOBA) against him this year. Yuck. The Yankees clearly like Shreve. He wouldn’t have stuck on the roster this long otherwise. And I get it. He’s a just turned 28-year-old southpaw with a history of missing bats. Guys like that are hard to find. If another team had Shreve and they designated him for assignment, I’d look at him as a potential reclamation project pickup. If Boone stops using Shreve as a left-on-left guy and starts using him as a mop-up man, he’ll be fine. It’d be fine. Just fine. Once again, Warren has been a boringly reliable Swiss Army Knife reliever this season. He did miss more than six weeks with a lat strain, which drags down his midseason grade, otherwise the guy has thrown 24.1 innings with a 1.85 ERA (2.94 FIP) and very good strikeout (28.4%) and walk (8.8%) rates. And he is what, the sixth best reliever in the bullpen? Yeah, that’ll play. I get the sense Warren will take on increased responsibility in the second half. The injury threw a wrench into things in the first half and it seems Boone is still trying to figure out when exactly to use him. In the second half though, I think Warren will be used for more multi-inning stints in the middle of the game as the Yankees look to control Luis Severino’s workload and also try to shorten games by not letting their starter go through the lineup a third time. Either way, Warren has again been a reliable bullpen arm who flies under the radar because the Yankees have so many good relievers. Missing all that time with the lat injury stinks, but you know what? It gave Holder an opportunity to emerge, and the Yankees are a better team now because of it. In that sense, Warren’s injury turned out to be a good thing. Now he’s healthy and again an effective do it all bullpen option. 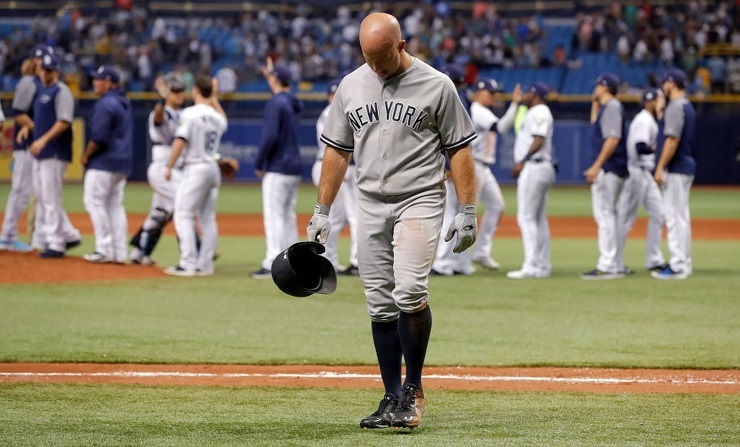 The Yankees hit the road this weekend but left their bats at home, opening the series in Tampa with a pathetic 2-1 loss. They were held to just five hits, extending their recent clutch-hitting slump. Friday’s 1-for-9 RISP performance made then 12-for-94 (.128) over their last 15 games dating back to June 6 against the Blue Jays. That was the worst batting average with RISP of any MLB team in that span (June 6-22). Prior to June 6, the Yankees were hitting .275 with RISP, the third-best mark in MLB at that point. There was really nothing spectacular to highlight from this game, so let’s have some fun with a few Obscure Yankeemetrics. This was just the second time in the last 20 years that the Yankees lost a game in which they allowed at least 10 hits but no more than one earned run (it also happened on May 18, 2004 at Anaheim). The only other time in franchise history they were held to one run or fewer by at least six different pitchers — and none of them got more than 10 outs — was when they were no-hit by the Astros staff on June 11, 2003. Thanks, #TheOpener. Brett Gardner’s GIDP in the top of the ninth sealed the Yankees loss. It was the first time in his career he grounded into a game-ending double play with the potential winning or tying run on base. Ok, that’s the end of #FunFacts for this series. 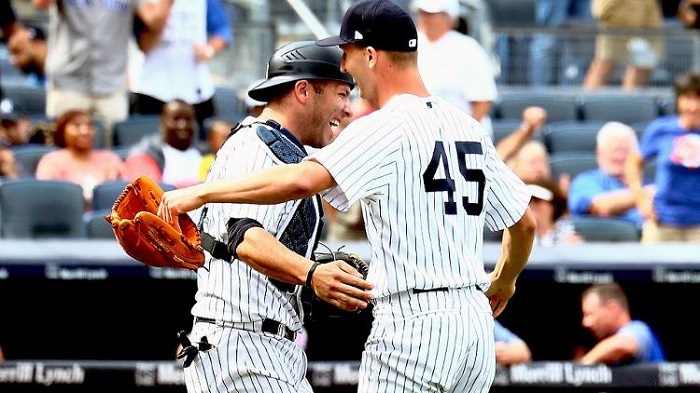 As a wise Hall of Fame catcher used to say … it was deja vu all over again for the Yankees on Saturday afternoon. Yet somehow it was even worse than Friday, as they were blanked for just the second time this season and held to four hits in a 4-0 loss. It’s the first time ever that the Yankees have scored no more than one run and had no more than five hits in consecutive games within a series against the Rays. It’s also the first time they lost back-to-back games to any team this season since May 22-23 at Texas. In that month-long span since then, every other team had lost at least two games in a row. Tropicana Field has been a legit house of horrors for the Yankees this decade. After dropping the first two games of this series in Tampa Bay, they fell to 30-43 (.411) at the Trop since 2010, their worst record at any AL ballpark in that span. First three-game losing streak of season; they were the only MLB team this season without a losing streak of three or more games. This was the farthest the Yankees went into a season with losing more than two games in a season since 1954 (games 122-124). First time swept in a series of at least two games; the only other teams this season that haven’t been swept in a multi-game series yet are the Red Sox and Astros. First walk-off loss of season; they were the only MLB team this season without a walk-off loss. This is just the fourth time in last 80 years that the Yankees had zero walk-off losses in their first 74 games. The other seasons? 2005, 1999, 1998. #SilverLining? It hardly seemed like the Yankees would even have a chance to play free baseball on Sunday based on the first few innings when Domingo German was pummeled by the Rays. He gave up six runs on nine hits, six for extra bases, before getting pulled with no outs in the fourth. Only three other pitchers in franchise history have allowed at least six earned runs and six extra-base hits in a game: Mike Mussina (2002), Dave Eiland (1991), Doyle Alexander (1982). Giancarlo Stanton was in full beast-mode, the lone offensive star in this game. He went 5-for-5 with two doubles and a game-tying homer. He’s the first Yankee with a five-hit game in more than six years, when Curtis Granderson did it on April 19, 2012 vs Twins. Since that date, every other MLB team has had at least one player get five hits in a game. It was also his fourth game with at least four hits this season, tied with Jose Altuve for the most in MLB; the rest of the Yankees have combined for four four-hit games (no one else has more than one). 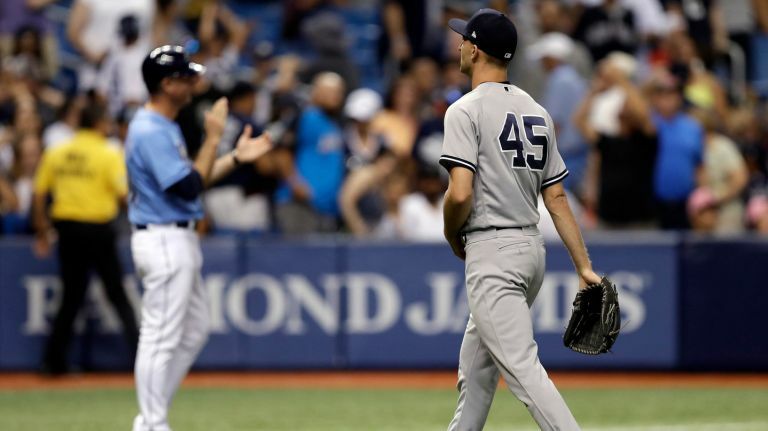 The Yankees bullpen held the Rays scoreless for eight innings after German’s early implosion, until … Mr. DFA (uh, Chasen Shreve) entered in the bottom of the 12th and gave up a solo homer to Jake Bauers on the very first pitch he threw. 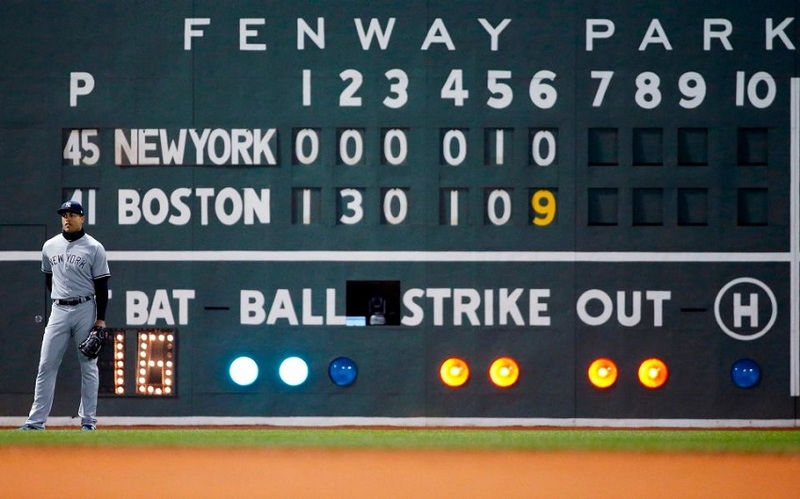 There’s ugly losses and embarrassing games … and then there’s what the Red Sox did to the Yankees in the series-opening 14-1 rout at Fenway Park. Last year the Yankees’ worst loss was by seven runs; they were the only team that didn’t suffer a loss of eight-or-more runs. After Monday night’s debacle, they joined the Phillies and Marlins as the only teams this season to lose a game by at least 13 runs. If you believe in the power of deja vu and strange coincidences, the last time the Yankees lost by the exact score of 14-1 was August 22, 2009. The opponent? Red Sox. The place? Fenway Park. And that 2009 season turned out okay …. While some blame must be placed on the dead-bat offense and lack of clutch hitting, the implosion by the pitching staff — from top to bottom — was the most humiliating part of the game. 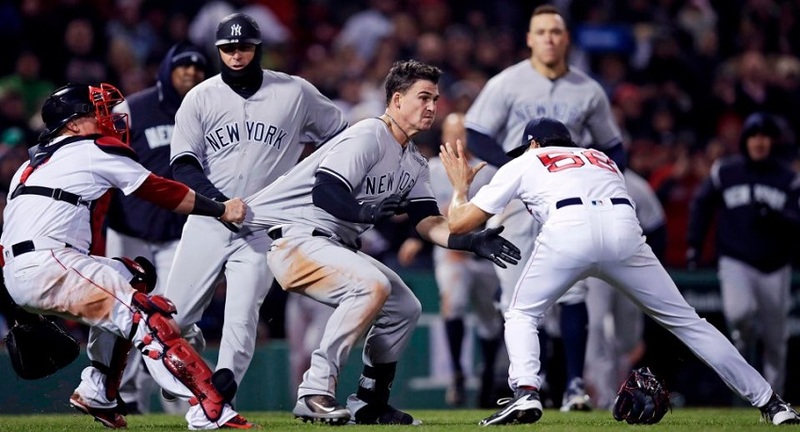 Three Yankee pitchers allowed at least four runs, just the second time in the last 25 seasons of this rivalry that had happened (the other game was July 15, 2005 in a 17-1 loss at Fenway). 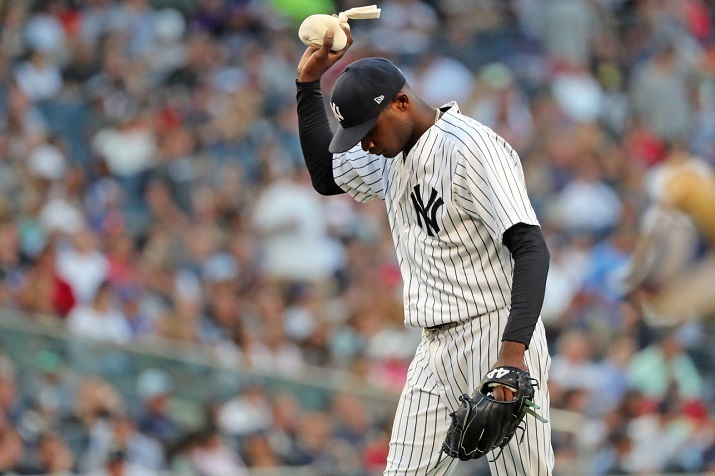 While Luis Severino looked bad and put the Yankees in an early hole, the meltdown by Tommy Kahnle and Chasen Shreve in a disastrous sixth inning essentially torched the game. The nine runs coughed up by the two pitchers in that frame was the Yankees most allowed in an inning against the Red Sox in nearly two decades (May 31, 1998). Six of those runs were unearned, their most given up in any game at Fenway Park since April 10, 1985 — the Yankee debut of anti-legend Ed Whitson. Kahnle was charged with five runs in two-thirds of an inning pitched, the first Yankee reliever since Ron Davis in 1981 to give up five-plus runs while getting fewer than two outs in a game at Fenway Park. Shreve gave up only one hit but it was a painful one — a grand slam to Mookie Betts that made it 14-1. Betts had a historic night at the plate, going 4-for-4 with five runs scored and four RBI. The only other player to score at least five runs and drive in at least four runs in a game against the Yankees was Ken Griffey Jr. on May 24, 1996. One of the few blemishes on Aaron Judge’s historic rookie season was his .083/.233/.167 slash-line in nine games at Fenway Park. It was the worst batting average by any Yankee in a single season with at least 35 at-bats at the stadium. He quickly slayed that dragon, going 3-for-4 with a mammoth 444-foot, 116.3 mph home run off Chris Sale in the fifth inning. Since Statcast began tracking data in 2015, it was the hardest-hit homer allowed by Sale and the second-longest homer allowed by Sale, behind a 451-foot blast from Tyler Flowers on July 8, 2016. The Yankees rebounded from Tuesday’s debacle with a 10-7 win, prevailing in an old-fashioned slugfest highlighted by dingers, haymakers and plenty of boiling-hot emotions. One day after scoring a single run on 10 hits, the Yankees pounded out 12 hits and plated 10 runs. It helps when you are 5-for-13 with RISP and 8-for-20 with runners on base, instead of 0-for-5 and 1-for-20 in those situations (as they did in the series opener). Gary Sanchez busted out of his early-season slump with a monster game, going 3-for-5 with two homers, a double, three runs scored and three RBI. Entering Wednesday, there were 228 players with at least 30 plate appearances; Sanchez ranked 228th in batting average (.056), on-base percentage (.081), OPS (.248), wOBA (.112) and wRC+ (-41). Yeah, he was literally the worst hitter in baseball. He became the only Yankee catcher with at least three extra-base hits and four RBI in a game against the Red Sox. It was also his eighth career multi-homer game, the most ever for a player in his first 200 career games. Oh yeah, this was Gary’s 187th game in the majors. Only four other Yankees had at least eight games with two-plus homers before their 26th birthday: Joe DiMaggio (17), Mickey Mantle (14), Lou Gehrig (13) and Joe Gordon (9). El Gary turns 26 on December 2, so he’s got the entire season to climb that list too. Masahiro Tanaka was solid through the first four innings — his only blemish was a solo homer to Hanley Ramirez in the first inning — but completely unraveled in the fifth. After surrendering an RBI double to Mookie Betts and then loading the bases, he left a flat slider over the heart of plate and J.D. Martinez planted it 436 feet into the centerfield seats. Before Martinez, the last Red Sox cleanup hitter to hit a grand slam against the Yankees was Jim Rice in 1987. It was the second time in two games that the Red Sox hit a slam against the Yankees, a remarkable feat considering that in 76 rivalry games from 2014-17, the Yankees gave up zero grand slams to Boston. The last time the Yankees allowed slams in back-to-back games against the Red Sox was when Juan Rivera and Mike Greenwell pulled it off in 1990. It was also the fourth grand slam the Yankees have given up in 2018 — the most in the majors and the most ever for the franchise in the team’s first 12 games. The major-league record for a single season is 14 by the 1996 Tigers, and the most allowed by a Yankee pitching staff is nine in 2000. Stay tuned, folks. The Yankees dropped the rubber game Thursday, 6-3, a score that looks much closer than the lifeless brand of baseball the team played for much of the night. The best part about the game was … they didn’t get no-hit? Sonny Gray was as awful as the weather at Fenway, getting rocked for six runs before getting pulled in the fourth inning. He also squeezed in three wild pitches and a hit batter. If that sounds hard to do, you are correct! 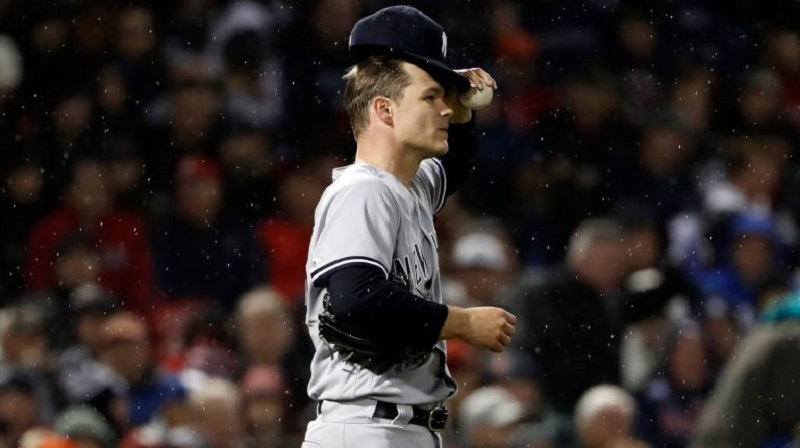 For that horrible performance, Gray earned our Obscure Yankeemetric of the Series: He is the first Yankee pitcher ever to give up at least six earned runs, throw at least three wild pitches and hit a batter in an outing of fewer than five innings. And following his latest clunker, Gray’s career ERA at Fenway Park stood at 8.66 in four starts, with 36 baserunners allowed (28 hits, 8 walks) in 17 2/3 innings. He’s also 0-3 with a 7.20 ERA in three starts against the Red Sox since joining the Yankees last July. 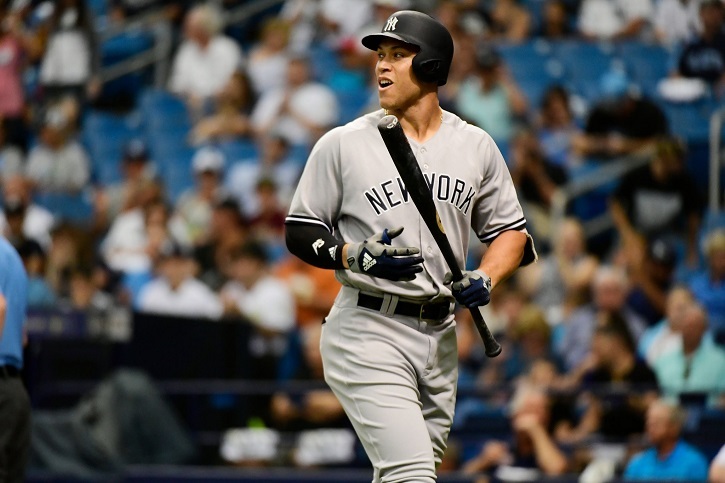 Aaron Judge was the first hero of the night, breaking up Rick Porcello’s no-hitter with a booming lead-off double to deep center in the seventh inning. Judge entered that at-bat 1-for-12 in his career against Porcello. Gary Sanchez was the second hero of the night, ending the shutout with a three-RBI, bases-loaded double in the ninth. That gave him a .662 slugging percentage at Fenway Park, the highest by any Yankee at the ballpark (min. 60 PA), and just ahead of two guys named Babe Ruth (.634) and Roger Maris (.630). Today, for the first time this season, the Yankees’ bullpen did not allow a run. And that’s only because the home opener was snowed out. The home opener has been rescheduled for tomorrow, assuming the weather cooperates. Whenever the Yankees play next, they’ll look to get the first scoreless game from their bullpen in 2018. Here are the combined bullpen numbers through four games: 13.1 IP, 12 H, 11 R, 11 ER, 5 BB, 18 K, 4 HR. Yikes. Only three relievers in the eight-man bullpen have yet to be charged with a run: Chad Green (still awesome), Jonathan Holder (allowed an inherited runner to score), and Chasen Shreve (hasn’t pitched yet). David Robertson has already allowed as many runs this year (four in two innings) as he did with the Yankees after the trade last year (four in 35 innings). Not great. The Yankees are built to win games like the two they lost. Tie game in the late innings like Saturday? The bullpen holds it down until someone on offense smacks a dinger. Three-run lead with three innings to go like Sunday? It’s supposed to be in the bag. Alas, things don’t always go according to plan, and the bullpen has been scored upon in all four games thus far. A few thoughts about this. 1. Dude, it’s four games. Obligatory small sample size reminder. Extremely small sample size, at that. Regardless of your opinion of the Josh Donaldson intentional walk, at some point we have to acknowledge Justin Smoak had a monster at-bat against Robertson. Nine pitches, fouled away a bunch of great curveballs. It really was a great at-bat. Sometimes you just get beat. I didn’t like the intentional walk, but credit Smoak for that battle. Anyway, as long as everyone is healthy, I feel pretty confident the key late inning relievers — specifically Green, Robertson, and Tommy Kahnle — will be excellent. Green’s been great so far as it is. 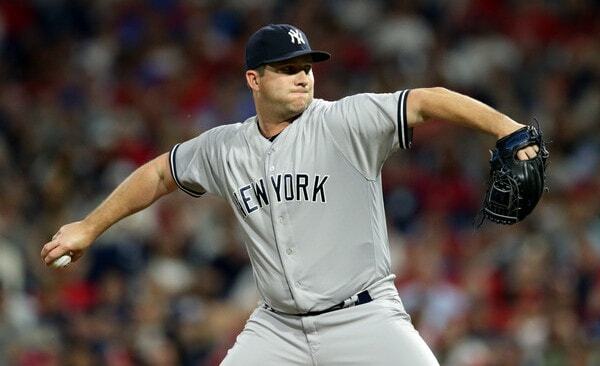 Also, getting Adam Warren back from his ankle bruise will help as well. Bullpens have bad series. It happens. When it happens in the first series of the regular season, it feels more meaningful even though it’s really not. The talent is still there. 2. Boone has to be more judicious with Betances. I expect Green, Robertson, Kahnle, Warren, and Aroldis Chapman to be fine going forward. Dellin Betances is a different animal, for better or worse. He’s given up two home runs in two appearances — his second homer came in his 56th appearance last year — which is unusual and annoying. Then again, every pitcher seems more homer prone these days. It’s happening to everyone. Betances has only walked one of the 13 batters he’s faced so far (and he was squeezed a bit), which is encouraging after last year, but it’s 13 batters. The larger point here is that while having confidence in your players is a good thing, Dellin is at the point where he has to earn back trust, and Boone has to be more selective with him. Eighth inning with a five-run lead on Opening Day? Perfect. Pushing him for a second inning in the late innings of a tie game Saturday? Eh. I’m a Betances believer. I think he’ll have a typical Dellin season, which means gobs of strikeouts and not much in the way of hard contact. Boone obviously expects Betances to dominate as well. Until he shows he can consistently though, Boone has to pick his spots with him. Use him for an inning at a time and in lower leverage spots. Dellin was a multi-inning monster from 2014-16. Those multi-inning days are pretty much over. 3. Eight relievers is one too many. Still not a fan of the eight-man bullpen. I get it, I totally do. Teams don’t want to overwork anyone early in the season and they’re terrified of running out of arms. And yet, four games into the season Shreve has yet to pitch, Warren has faced three batters, and Holder has faced two batters. It’s not like the starters have pitched super deep into games either. CC Sabathia went five innings and Sonny Gray went four. The presence of the eighth reliever creates some sense of obligation to actually use him from time to time. 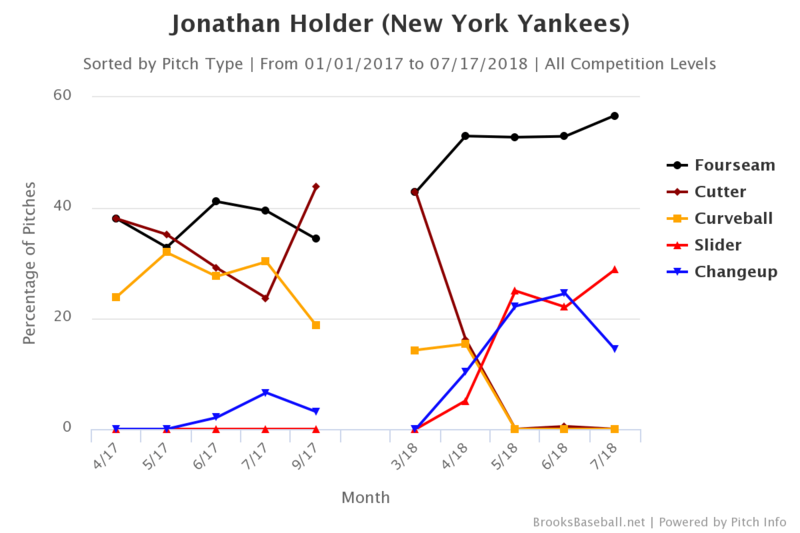 The Yankees hadn’t played since Monday when Holder was brought into Saturday’s game, and I think that factored into the decision to use him. He needed work! Want to improve the bullpen? Get rid of the weakest link. If things go haywire and a fresh arm or two is needed the next day, you call them up. Eighth relievers, man. Teams want them but they’re never really all that useful. 4. If the Yankees have to make changes, they will. It’s still way too early to freak out about the bullpen. Can we at least give them a homestand first? Please? If the sample grows and the struggles continue, and the Yankees have to adjust their bullpen personnel, they will. They did last year. Maybe that means call-ups, maybe it means trades. If the current group doesn’t do the job the Yankees will make changes. The bullpen at the end of the season very rarely looks like the Opening Day bullpen. Injuries and poor performance inevitably lead to roster changes throughout the season and nowhere on the roster is that more applicable than in the bullpen. Relievers are inherently volatile. If changes are necessary, changes will be made. Right now, it’s way too early to say changes are necessary. Bullpens have bad series now and then, even great ones. The Yankees’ vaunted bullpen just had a bad series, and right now, it’s too early to say it’s anything more than that.